In case you're wondering, I haven't forgotten my Blogger password to log in or anything--although that WOULD be a good excuse for not writing, huh? No, I've just not been doing so hot at counting calories, and I don't have much to write about. I *did* start Hal Higdon's Spring Training this week though. I'm kind of excited about it, because it involves a little bit of everything (hills, speedwork, Fartlek, races, long runs, etc). 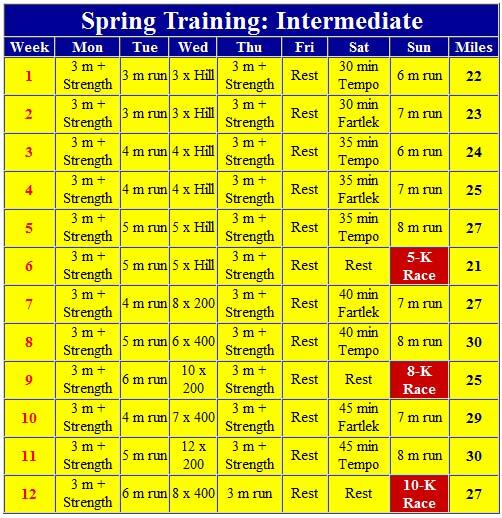 My biggest problem with training schedules is that I skip the strength training. I REALLY need to start doing it! Anyway, so even though I've not been eating very well, I have still been running. As for the stray cat... I took him to the vet a couple of days ago. Jerry and I were laughing so hard we almost peed our pants because we had to take Chandler (my 21-lb cat) to update his vaccines, along with the skin-and-bones stray cat for a look-over. I had explained on the phone about the stray. So Jerry and I went in with the cats, him carrying Chandler and me carrying the stray. The woman asked which one was the stray, and Jerry and I laughed so hard we couldn't breathe. Um, Chandler is so fat that he looks like a beach ball with toothpick-legs sticking out. And the stray is so skinny you can see all his bones. Which would YOU think was the stray?! I mean, honestly, does Chandler look like he's missed a single meal EVER? Anyway, $150 later, I learned that he is, in fact, a neutered male, MUCH older than 4 years, with terrible teeth; he's negative for feline leukemia and FIV. And he needs a $250 tooth extraction. Ugh! We don't have the money to do that. I know if I take this cat to the shelter, he'll be put down because nobody is going to adopt a cat that needs surgery right off the bat. And I've tried finding him a home, but with no luck. My kids have pretty much convinced me to keep him, and we've even named him Paolo. (We name our pets after Friends characters... see my About Me page for details on that!) Remember Rachel's boyfriend Paolo from the first season? That's where we got his name. I just finished reading Ali Vincent's book "Believe It, Be It" and it was really lame. If you don't know her, she won The Biggest Loser a few seasons ago. I was hoping her book would offer some behind the scenes info from the show or at least more of an in-depth look into her life, but it was basically a re-cap of what you saw on TV that season. Well obviously, I'm running out of things to write about. I'll TRY tomorrow, I REALLY will, to count my calories. Hey Katie! I just found your blog and I love it :) I'm following you now and can't wait to read more. BTW, your cat is SO cute. LOVE the cat story! No, Chandler doesn't look like he has missed any meals. I'm struggling to count calories too. Since I've been back from vacation it has been a battle every day. Hoping to get back into the groove! I don't know about your area of MI, but over here in GR, there are quite a few no-kill cat shelters. Carol's Ferals, Focus on Ferals, and Crash's Landing. They all focus on finding homes for stray cats. Perhaps your local animal shelter can recommend someone? You have such a good heart to take in Paolo. There's got to be a way to get him the surgery that he needs.